We are learning far more about ourselves thanks to the Human Genome Project. Adding this avalanche of new findings to what has been collected by other branches of discovery since, for example, the Taung child skull found in South Africa by Raymond Dart, 1925, seem to be getting us closer to how branching migratory activity mingled small groups of our human ancestors. We have used the term ‘Neanderthal’ (sometimes spelled with the ‘h’) as a derogatory and humorous description of a non too bright character. But now we find we carry Neanderthal genes and they have great significance, indeed respect is due! “In a recent annual meeting of The American Society of Human Genetics, researchers announced that some “Neandertal” genetic variants inherited by modern humans outside of Africa are not peculiarly Neandertal genes, but represent the ancestral human condition. The work highlights just how much diversity was lost when people passed through a genetic bottleneck as they moved out of Africa. Which type of ancestor met with the Neanderthal is becoming traceable through the Genome research. 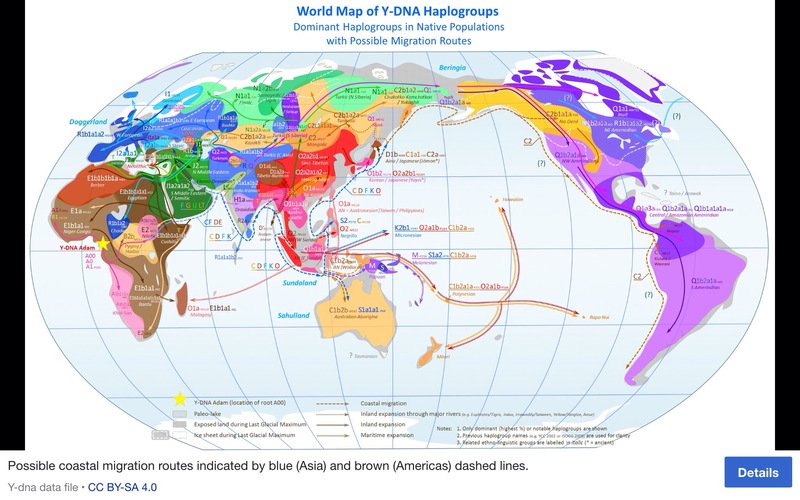 The Andamans are theorised to be a key stepping stone in a great coastal migration ( https://en.m.wikipedia.org/wiki/Coastal_migration#/media/File%3AWorld_Map_of_Y-DNA_Haplogroups1.png) of humans from Africa via the Arabian peninsula, along the coastal regions of the Indian mainland and towards Southeast Asia, Japan and Oceania. Classification of peoples has been a historical process, just as names of nations, boundaries of countries, counties, towns, villages has been a method of differentiating one from another, from the outside in, very often. These perspectives have been drawn by those in a position of power to decide and write these terms into our ‘educational’ materials. The terms might be challenged by those viewings from the inside out, but it is rare there are changes made. Only when a nation seeks independence from a once greater power, may a nation choose its own name for example. But the name may still be chosen on behalf of the citizens, rather than by them. Take the name Apache. The name Apache comes from a Zuni word meaning “our enemies”; their own names for themselves are Ndee, Inday, and Dine’é, which mean “the people” in their languages. Today most Apache people also use the name “Apache,” which is frequently spelled Abachi or Abaachi in their own orthographies. Spelling variants on these names include Apachi, Nde, Dine’, Dine’e, Tineh, Tinde, Chinde, Inde, Indé, Indee, and Nnee. Then we ask ourselves, what is a Zuni word? And the Internet answers with: “Most live in the Pueblo of Zuni on the Zuni River, a tributary of the Little Colorado River, in western New Mexico, United States. Zuni is 55 km (34 mi) south of Gallup, New Mexico. In addition to the reservation, the tribe owns trust lands in Catron County, New Mexico and Apache County, Arizona.” Obviously the tribes they called Apache were their enemies. And they came up with the word ‘Apache’ and it stuck. So it was, in 1832, a French explorer, Dumont D’Urville classified the peoples of Oceania into four racial groups: Malaysians, Polynesians, Micronesians, and Melanesians. D’Urville’s model differed from that of Bory de Saint-Vincent in referring to ‘Melanesians’ rather than ‘Mélaniens.’ The concept of ‘race’ sprang out of early anthropology which is best consigned to the bin of ignorance, but labels are still used until we can throw off race related ignorance. Jonathan Friedlaender states, “The first settlers of Australia, New Guinea, and the large islands just to the east arrived between 50,000 and 30,000 years ago………” See my August 25th blog for more on that subject. There were certain health risks which evolved. One unpleasant example Is evidence that modern genital warts – otherwise known as the human papillomavirus (HPV) – were sexually transmitted to Homo sapiens after our ancestors slept with Neanderthals and Denisovans once they left Africa. So it isn’t all good news about sleeping with cousins, it took is thousands of years to learn not to do that! I’m first finding out about ‘Melanesia’. “Most of the peoples in Melanesia have established independent countries, are admistered by France or have active independence movements (in the case of West Papua). Many have recently taken up the term ‘Melanesia’ as a source of identity and “empowerment.” Stephanie Lawson writes that the term “moved from a term of denigration to one of affirmation, providing a positive basis for contemporary subregional identity as well as a formal organisation”. For instance, the author Bernard Narokobi wrote about the “Melanesian Way” as a distinct form of culture that could empower the people of this region. The concept is also used in geopolitics. For instance, the Melanesian Spearhead Group preferential trade agreement is a regional trade treaty among Vanuatu, the Solomon Islands, Papua New Guinea, and Fiji.” Wikipedia. The original inhabitants of the group of islands now named Melanesia were likely the ancestors of the present-day Papuan-speaking people. Migrating from Southeast Asia, they appear to have occupied these islands as far east as the main islands in the Solomon Islands, including Makira and possibly the smaller islands farther to the east. They are known as the Lapita culture, and, like our ( https://ww2.kqed.org/quest/2011/08/29/how-neanderthal-are-you/) Neanderthals ancestors, were expert in seamanship and navigation, reaching out and finding islands separated from each other by hundreds of miles of empty ocean. Their descendants, the Polynesians, would populate islands from Hawaii to Easter Island. Present evidence from fossils defines Neanderthals as evolving in Europe, separate from modern humans in Africa for more than 400,000 years. They are considered either a distinct species, Homo neanderthalensis, or more rarely as a subspecies of Homo sapiens (H. s. neanderthalensis). They will have been separated due to our constantly changing planet, and the search is on for other species of ancestor who may have evolved separately until meeting at some location. Based on his genetic studies of the Denisova hominin, an ancient human species discovered in 2010, Svante Pääbo claims that ancient human ancestors of the Melanesians interbred in Asia with these humans. He has found that people of New Guinea share 4%–6% of their genome with the Denisovans, indicating this exchange. The Denisovans are considered cousin to the Neanderthals. Both groups are now understood to have migrated out of Africa, with the Neanderthals going into Europe, and the Denisovans heading east about 400,000 years ago. This is based on genetic evidence from a fossil found in Siberia. The evidence from Melanesia suggests their territory extended into south Asia, where ancestors of the Melanesians developed. 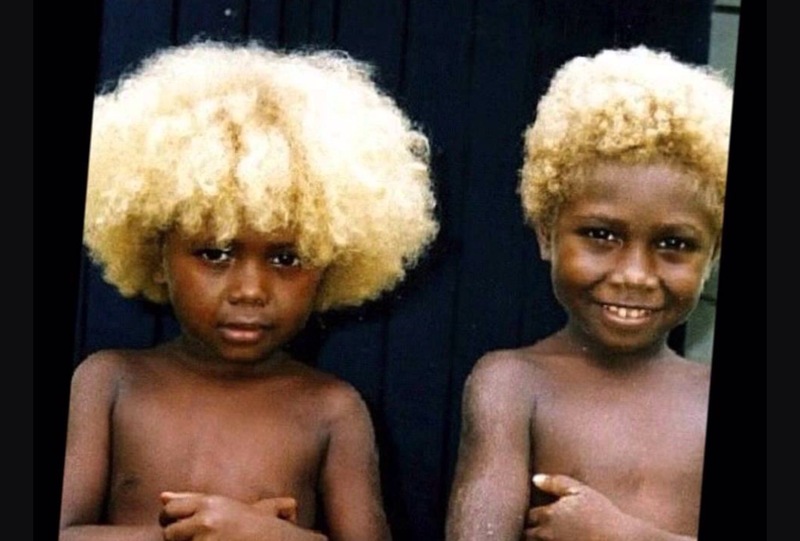 Melanesians of some islands are one of the few non-European peoples, and the only dark-skinned group of people outside Australia, known to have blond hair. The blonde trait developed via the TYRP1 gene, and is not found in European blonds. When archaeologist began finding pottery remnants on the various islands they named them as Lapita. 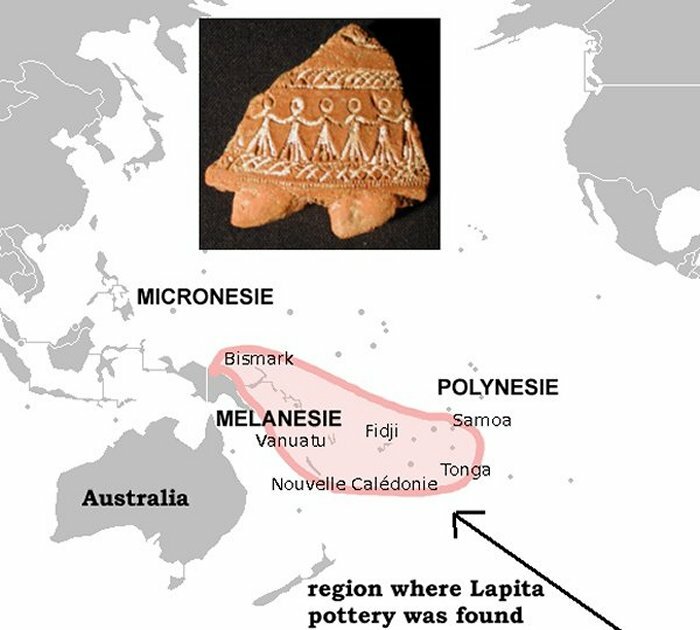 The term ‘Lapita’ was coined by archaeologists after mishearing a word in the local Haveke language, xapeta’a, which means ‘to dig a hole’ or ‘the place where one digs’, during the 1952 excavation in New Caledonia. The Lapita archaeological culture is named after the type site where it was first uncovered in the Foué peninsula on Grande Terre, the main island of New Caledonia. The excavation was carried out in 1952 by American archaeologists Edward W. Gifford and Richard Shulter Jr at ‘Site 13’. Their culture or tradition was prehistoric just as the Zuni Indians in the Americas (between 2500 B.C. and 700 A.D. ) and the island of Fiji was settled before or around 3500 to 1000 BC. Almost a parallel existence, and since no one knows exactly, maybe they were developing separately but from a split migration from some point in the past. The Lapita pots were usually created by any materials that were accessible, as well as the techniques used to make such detailed designs. The low-fired earthenware pottery, often tempered with shell or sand, is typically decorated with a dentate (toothed) stamp. It has been theorized that these decorations may have been transferred to or from less hardy mediums such as tapa (bark cloth), mats or tattoos. Undecorated “plain-ware” pottery is an important part of the Lapita cultural complex, which also includes ground-stone adzes and shell artefacts, and flaked-stone tools of obsidian, chert and other available rock, as well as the remainders of breakers, cooking pots, and bowls. The study found a high rate of genetic differentiation and diversity among the groups living within the Melanesian islands, with the peoples distinguished by island, language, topography, and geography among the islands. Such diversity developed over their tens of thousands of years of settlement before the Polynesian ancestors ever arrived at the islands. For instance, populations developed differently along the coasts than in more isolated valleys. In the archaeological record there are well-defined traces of this expansion which allow the path it took to be followed and dated with some certainty. 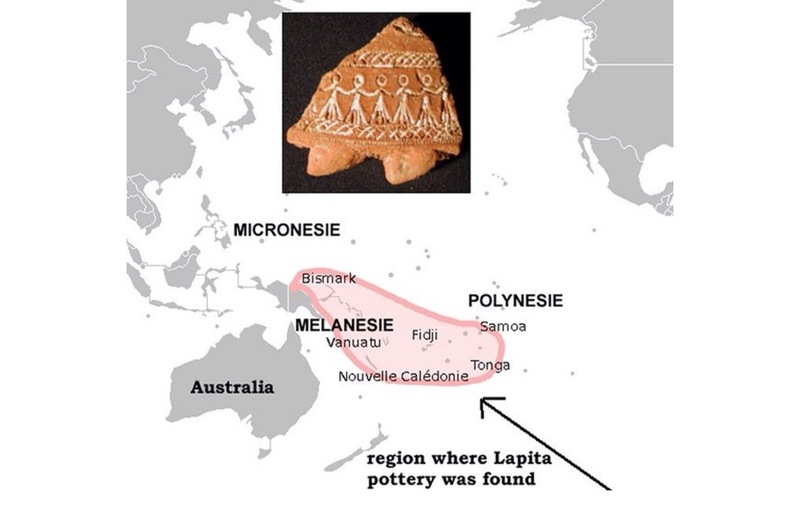 It is thought that by roughly 1400 BC, “Lapita Peoples”, appeared in the Bismarck Archipelago of north-west Melanesia. This culture is seen as having adapted and evolved through time and space since its emergence “Out of Taiwan”. They had given up rice production, for instance, after encountering and adapting to breadfruit in the Bird’s Head area of New Guinea. In the end, the most eastern site for Lapita archaeological remains recovered so far has been through work on the archaeology in Samoa. The site is at Mulifanua on Upolu. The Mulifanua site, where 4,288 pottery shards have been found and studied, has a “true” age of c. 1000 BC based on C14 dating. A 2010 study places the beginning of the human archaeological sequences of Polynesia in Tonga at 900 B.C., the small differences in dates with Samoa being due to differences in radiocarbon dating technologies between 1989 and 2010, the Tongan site apparently predating the Samoan site by some few decades in real time. Five of the Solomon Islands have disappeared into the Pacific Ocean due to rising seas and erosion, in what Australian researchers say is the first major effect of climate change on the coastlines and people of the Pacific. The Solomon Islands archipelago has seen annual sea levels rise as much as 0.4 inches, according to research published in Environmental Research Letters. Using aerial footage, radiocarbon dating of trees and traditional knowledge, researchers discovered that five tiny islands that existed in 1947 had completely disappeared by 2014. On top of the uninhabited, submerged islands—which range in size from 2.5 to 12.4 acres—six other islands have seen chunks of land washed into the sea, forcing entire villages on two of them to be relocated. One of the islands affected was Nuatambu, which lost half its habitable area since 2011, including 11 houses. The Solomon Islands is a nation made up of hundreds of islands, with a population of about 640,000 people. And so humans continue to struggle for survival against difficult odds. This entry was posted in Uncategorized and tagged Africa, apache, asia, fiji, genetics, melanesia, new guinea, new mexico, pacific, seafaring neanderthals, taiwan, taung skull, tectonics, zuni. Bookmark the permalink.